I realized the impact of lacking the knowledge of what customer wants when a product that I was working on was shelved for lack of market. An entrepreneur needs to know what customers want, be it in service or in product, in advance. Vision is almost everything for an entrepreneur. It not only steers the company in the right direction, but also motivates people who work for you. A good product is not a result of how much money you spend in developing it or how much you pay for hiring the best talent. I believe all that someone needs to be happy is something to be enthusiastic about. A good entrepreneur understands this, and leads the people with his vision and extracts the best out of them. To me a real entrepreneur is one who can say this at any point in time. For these reasons, the entrepreneur I admire the most is Steve Jobs. This was one of the the essays I wrote while applying to the Marshall School of Business last year. I am preparing for my first final exam (Strategy) of business school. We have a case on Apple Inc., and I can’t help but wonder the void Steve Jobs has left behind in consumer electronics industry. P.S. : Some portion of the essay has been edited for not-so-obvious reasons, but 95% is unchanged. It has just been 3 weeks since I have been in Los Angeles, but it seems like a long time. Business school is a lot of fun and hard work at the same time. It doesn’t take much time to realize that. One week of International orientation, followed by a week of MBA orientation and one week of classes exposed us to multitude of activities that reduced the sleeping hours to bare minimum required – create-a-country, career services, guest speakers, outdoor activities, Trojan marching band, parties, barbecue, baseball game, student clubs, case competition, and assignments. International orientation steadily prepared 50 odd international students to the onslaught that was upon us in the following week. It created a smooth transition to the american education system, culture and its nuances. It didn’t take long to know each other and were thrilled to learn the different blend of cultures we bring together. Though dominated by students from China and India, there are few from Spain, Bulgaria, Australia, Russia, South Korea, Lithuania – total of 20 different countries. 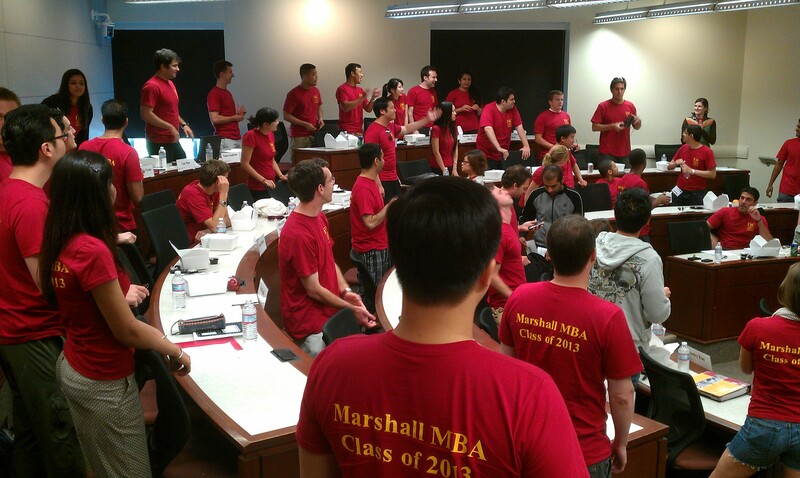 MBA orientation made a bigger impact and seemed intimidating when walking into the lobby with 220+ people. I was meeting most of them for the fist time. The schedule of the orientation week was hectic to say the least, from 8am to 8pm on most days. Wonderfully crafted orientation gave us enough time to mingle with each other and learn more about fellow classmates. There are people from diverse backgrounds – film makers, producers, professional gamblers, professional tennis players, wildlife photographers (ya, that’s me) amongst many bankers and consultants. Provided breakfast, lunch and dinner on most days saved me a lot of trouble as I was just settling down in the new apartment. The last two days of the orientation was the most enjoyable and trying at the same time. 3 cores with 39 teams were to compete in a series of outdoor activities on penultimate day, and a case competition on the last day. Executives from Nestle, trojan alumni, were on the judging panel for the case competition and the finalist teams had a great opportunity to showcase their analysis skills to them. Winners were from core C, but everyone had a great learning experience. Parties followed the end of orientation. Starting August 1st, we had our regular classes with a case and few other reading before the first class. Interspersed with academics is various community activities, one of which is a plane pulling event to raise funds for special olympics. Please have a look here. Also the career service activities are keeping us busy with many workshops. All these means less time to sleep. My average sleep hours in the last few weeks is about 5hrs. But it’s fun! Many of my friends are asking me how is LA. I love the weather, it’s very very much like Bangalore. I haven’t got much time to go out and explore LA much, but I’m having a great time in the business school. But I did travel around San Francisco and San Diego on my first week in the US, and will write about it some time in future. LA can wait. P.S. : The image and video were captured on my HTC Inspire phone – impressive, isn’t it? Of course the image quality.